In search of uniqueness and creativity, one would be hard-pressed to point to any band signed on a label. With the popularity of indie artists spiking, even some of the once-original artists are falling prey to trends and formulas. Every once in a while, however, a new artist springs up with a distinctive sound that makes you stop and take notice. 'Peculiar' is the best word to describe Christoper Noyes' music. From the strange instruments to the cryptic lyrics and an off-kilter music video, this is truly something new. Christoper is a one-man show. All the steps from the initial inspiration to the final product is done by one guy. There are a lot of samples and electronic elements that run throughout the Grapheme EP. You won't hear an abundance of autotuned vocals here and you definitely are not going to be able to identify all the sounds you hear. Scissors, tools, kitchen utensils, and random household objects are just some of the things thrown into the mixes. There are your standard fare of guitars and keyboards, as well. With any of the songs, it is tough to label them with a genre. "Children of the Pyramid Builders," for example, blends electonrica elements with pop hooks, an experimental vibe and a typewriter sample. Even within the individual songs there is a constantly evolving sound that never rests or becomes comfortable. The lyrics are just as aberrant as the experimental musicianship. In the title track, Christoper says, "On mountain peaks, the plates beneath, When they move, we move, Though all we see are the tree tops or the white snow, Explain the earthquake to the redwood or the foxhole, You could lose your mind." At first listen, some of the songs can come off as ramblings with little direction. Upon careful examination, however, it becomes clear that Christoper is diving into deep, often metaphysical topics while coating on layers of mystery. "You Chose Terra-Cotta Over Tungsten" is a commentary on our prideful human nature, "I am a liar, All broken armed from painting bone hues all my life, Yes I am a liar, And hiding doesn't make me any cleaner, Choking for the image sake I can barely operate, Cast the pavlov-anklets and loose the self-preserving-me, Let me be weak." 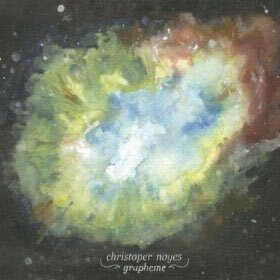 While some will applaud the vision, Grapheme is certainly not for everyone; others may find it awkward and even turn away from Noyes' music altogether. The five tracks make for a decent sized EP, running for almost 27 minutes. The debut full-length is currently being written and recorded, and one must wonder where Noyes will take his music next. For a first impression, this is as impactful as it gets.